Jammu and Kashmir is one of those states that has become famous for its many sided culture. 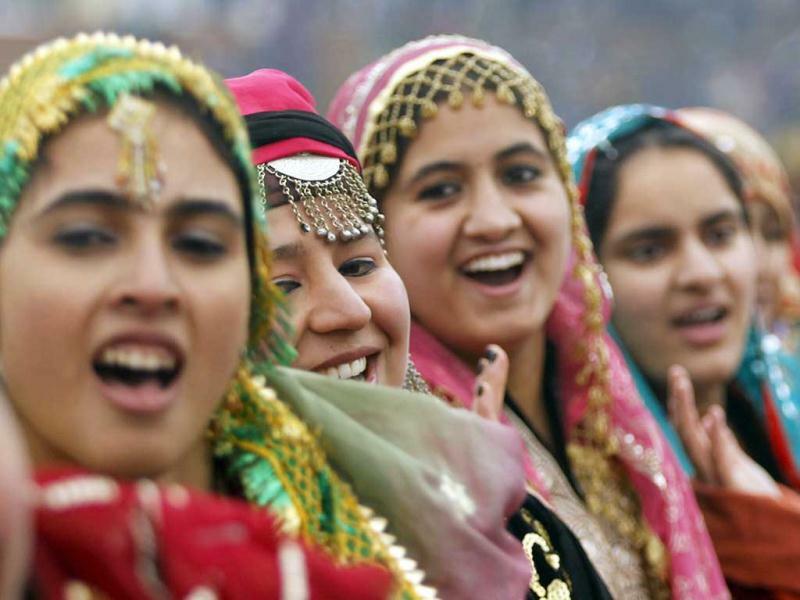 The three regions namely Jammu, Kashmir and Ladakh have different people with their diverse culture and traditions. Jammu is dominated by Hindu population, Kashmir has major Muslim population and in Ladakh, most people follow Buddhism. But one thing that is common to people all regions is the love, affection, and tolerance they have for each other. Even tourists are considered as a part of the family. If you ask a locale about a place to stay, you will probably end up enjoying your vacation in his home, and if you like something worn by a locale and ask him where he bought it from, he will probably offer the same thing to you. That is how simple people of Jammu and Kashmir are, far away from artificial feelings, and deception of life. The lifestyle of people is totally different from that of adjoining states. The food they eat, the dresses they wear, the language they speak is all different and unique. Though Ladakh region shows a strong resemblance to Tibet in all things. There are three main religions that are followed in Jammu and Kashmir. Kashmir has majority of Islam, Jammu has major strength of Hindus and most of the population in Ladakh follows Buddhism. There is also a group of people who are called Dogras. There major population lives in Jammu region and follows Hinduism but few of them also follow Islam. Urdu is the official language of Jammu And Kashmir State. Though it is spoken throughout the state but it is most widely used in Kashmir. The other languages spoken here are Kashmiri, Ladakhi, and Dogri language. Dogri is the language of Dogra people, in 2003, the language was accepted as a national language of India. Jammu and Kashmir is a state of different religions and beliefs. And accordingly, the customs followed and festivals celebrated are many. But the heartening thing about the all festivals here are that they are celebrated by people of all faiths together with same enthusiasm. Main festivals includes - Eid-ul-Fitr, Baisakhi, Lohri and Hemis Festival. The moment you enter the state of Jammu and Kashmir, you will notice that the clothing here is totally different. Most people here wear traditional clothes, though you will see working executives and youngsters in western clothes as well. Traditional clothes for men include Kurta Pyjama in summers, but in winters, woolen clothes come out. A kind of an overcoat called Pheran is worn over Kurta. It is quite loose but inside Pheran, a warm pot called kangri is kept, such is the severity of winters here. For women, ladies suit and Burqha (veil) is the most common attire in summers and in winters Phreran are used. What lights your soul in Jammu and Kahsmir more than then anything is the beautiful people of the state. They teach you a new way of living a happy life under all circumstances and giving others a lesson.